Moskva: Izd-vo "Muzyk", 1982 262 p. Quarto. Very good, with modest wear to the red cloth black- and gold-stamped binding. 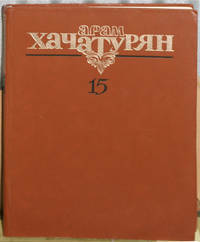 Sobranie Sochineniia v Dvadtsati Chetyrekh Tomakh [Collected Works in 24 volumes]. Collected works Volume 15 only. Concerto I. Allegro ma non troppo e maestoso; II. Andante con anima; III. Allegro Brillante (1936); Concerto-Rhapsody for Piano and Orchestra (1968). ''The Concerto for Piano and Orchestra in D-flat major was written in the autumn of 1936 when the composer was completing his post-graduate studies at the Moscow Consevatoire under the guidance of Nikolai Myaskovsky. . . . The score of Aram Khachaturyan's Piano Concerto was first published by the Muzgiz, Moscow, in 1946, and the two-piano score, in 1940. . . . The present publication is based on the last edition of the score which appeared in the composer's lifetime (Moscow, Muzgiz, 1957).'' The Concert-Rhapsody for Piano and Orchestra in D-flat major was completed in 1967 as part of the second of two trilogies of concertos for piano, violin, and cello that frame Khachaturian's compositional career. ''The changes which he introduced the solo part of his two-piano version have been taken into account in the present publication based on the edition that appeared in the composer's lifetime.''. Cloth. Very Good. 4to - over 9¾" - 12" tall.